How to get to the map from outside of Glast Heim? While talking to Zealotus, agree with her and offer to help her with her man. You must bring a Whip Class weapon with you (do not have to be equiped) in order to *whip* him. 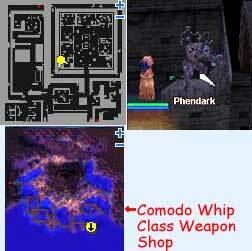 You can buy a whip class weapon at the southwest corner of Comodo. Talk to him about Phendark, he will suggest you to get Phendark to eat 369 Dark Crystal Fragments. That will help him bring out more of his inner demons. First, feed Phendark the 369 Dark Crystal Fragment. Second, go back to ask Rybio what to do next, he will suggest you to use Reverse psychology. Doing that will piss off Phendark greatly, making him back to his monster self. Now that you helped Phendark, she will give a share of her power to you. That is, she will make you the mask when you give her the required items. The mask you get will have your character's name written on it, you can only do this quest once.